SACRAMENTO, Calif. — The Cleveland Cavaliers will miss the postseason for the first time since 2014 and will be painfully reminded of their title-contending days, and life without LeBron James, when they visit the Golden State Warriors on Friday for the first time since the 2018 NBA Finals. But the rebuilding franchise has reason for hope these days: rookie point guard Collin Sexton, who has improved his play dramatically over the second half of the season. “Collin has exceeded my expectations as a rookie in this league,” said Cavaliers coach Larry Drew. Since the All-Star break, Sexton is averaging 20.9 points, trailing only Dallas’ Luka Doncic and Atlanta’s Trae Young among rookies, and shooting 48 percent from the field and 42.9 percent from 3-point range. He also scored at least 20 points in eight straight games to become the first rookie since Tim Duncan (1998) to accomplish that feat. Moreover, Sexton is on pace to become just the third rookie to average 16 points while shooting over 40 percent from 3-point range and 80 percent from the free throw line, potentially joining Larry Bird and Stephen Curry. Sexton has come a long way in a short time. He’s also endured plenty of change in his first year in the NBA: James’ departure, his first NBA head coach fired, and lots of losing with an injury-plagued team that has used 29 different starting lineups. 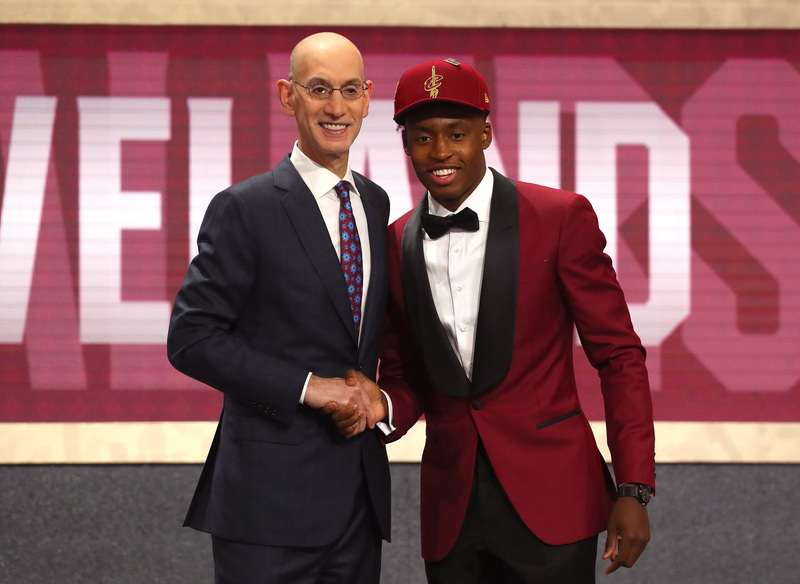 Collin Sexton (right) with NBA commissioner Adam Silver (left) after being drafted eighth overall by the Cleveland Cavaliers during the 2018 NBA draft at the Barclays Center in Brooklyn, New York, on June 21, 2018. The Cavaliers actually worked out Sexton the day after they were swept by the Warriors in last year’s Finals. Cavs owner Dan Gilbert expressed excitement over a prospect, presumed to be Sexton, on social media that same day. The 2018 Southeastern Conference Co-Freshman of the Year, Sexton had led Alabama to its first NCAA tournament win since 2006 and averaged 19.2 points, 3.8 assists and 3.6 rebounds as a freshman during the 2017-18 season. With All-Star point guard Kyrie Irving long gone, Cleveland selected Sexton with the eighth overall pick in the 2018 NBA draft as its point guard of the future. But soon after arriving in Cleveland, Sexton learned he would not be passing the ball to King James. The four-time NBA MVP decided to take his talents to Los Angeles to join the Lakers. Sexton entered the season as the backup to veteran point guard George Hill and had the opportunity to learn under coach (and former NBA point guard) Tyronn Lue. But that relationship was short-lived. Lue was fired on Oct. 28 after a disappointing start to this season, which included six straight losses, and was replaced by Larry Drew. Sexton, still a teenager at the time, witnessed his first coach firing just days into his rookie season. Ten games into the season, Sexton was thrust into the starting lineup after Hill suffered a shoulder injury. But the Cavaliers continued their horrible start, falling to 1-10. Veteran Cavs players placed part of the blame on Sexton, according to multiple reports. Sexton responded by spending more time in the gym. 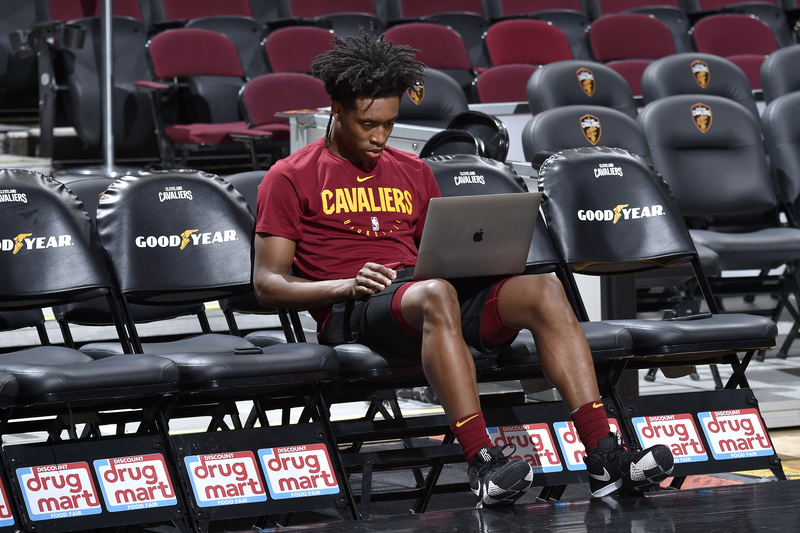 Collin Sexton of the Cleveland Cavaliers reviews film before a game against the Detroit Pistons on March 2 at Quicken Loans Arena in Cleveland. Drew said he told the veteran players to lay off Sexton, reminding them they were once 19 years old too. The Cavaliers’ point guard position officially became Sexton’s after Hill was sent to the Milwaukee Bucks in a three-team trade on Dec. 7. Hill was confident Sexton could fill the starting role. “He is very humble and hardworking,” Hill said. “We would talk a lot. He would ask questions about different things, even on the court, defensively and everything. Sexton averaged 15.1 points and 2.9 assists in 30.4 minutes per game before the All-Star break. While he is a private person, he acknowledged that one of his goals was to make the Rising Stars Challenge. Sexton, however, didn’t make the team. “I just used that as some more fuel,” Sexton said of the snub. Through it all, one thing Sexton refused to do was stop working on his game. The 6-foot-2, 190-pound guard has been accused of working too hard. At Alabama, then-head coach Avery Johnson tried to figure out ways to keep Sexton out of the gym late at night because he thought the freshman was overworking himself. In Cleveland, Sexton is known for going to the Cavaliers’ practice facility in Independence, Ohio, after games or road trips to get shots up with his father late into the morning. The Cavaliers have a virtual shot monitor that can tell how many shots a player takes in their practice facility. During one week this season, Sexton actually took about a third of the 9,000 shots taken in the practice facility, a source said. “I get in the cold and hot tub after a game first before I go shoot. It’s nothing too crazy, nothing too wild,” Sexton said. “I just get in the gym and refresh my mind and release some stuff. The latest I left is like 3 o’clock in the morning. Sometimes I will go there when our plane lands after a road trip. The security knows I’m there. Collin Sexton of the Cleveland Cavaliers goes up for a layup against the Phoenix Suns on April 1 at Talking Stick Resort Arena in Phoenix. 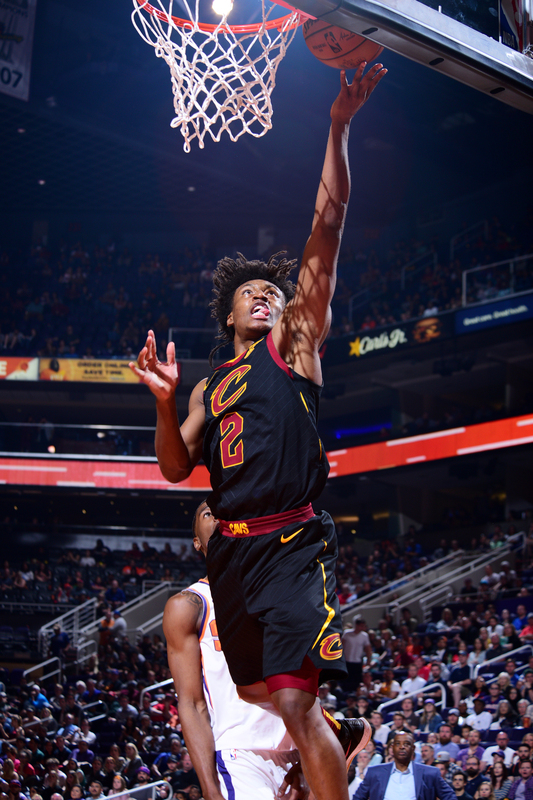 While Sexton has been playing well, it has not translated into wins for the Cavaliers, who are 19-60 after a 117-104 loss to the Sacramento Kings on Thursday night. But Sexton, who turned 20 in January, hopes his improved play will land him on the NBA All-Rookie first team. No matter the outcome, Sexton is focused on continuing to improve his game this offseason. In May, he also plans to go back to school at Alabama, adamant about keeping his promise to his parents to get his bachelor’s degree. On and off the court, it’s apparent Sexton is trying to get better no matter the challenge.